Moncloa / Argüelles has everything you could possibly need, just a short walk or metro ride away from the city centre. If you want to see exactly where it’s located in relation to the other barrios, check out our interactive map. Moncloa has a wonderful vibe, and it’s packed with shops, bars, supermarkets and great restaurants. It’s in close proximity to Gran Vía and all the shopping and theatre that you could wish for. If you’re coming to Madrid to study, this is definitely where you want to live, as it’s close to both Universidad Complutense and the Universidad Politécnica. It’s got a great transport network as Moncloa Station is home to the line 3 and line 6 of the metro, as well as a wide range of bus routes. The A-6 road, which is the main road leading to the northwest of the country also exits from here. There are other close Metro stops on line 3 like Argüelles, Ventura Rodríguez and Plaza de España. Although it’s within walking distance, Moncloa feels a lot fresher than the city centre as it’s surrounded by green spaces and fresh air. It’s a great place to find a shady patch of grass and to sit back and enjoy a good book. While you’re at it… No visit to Madrid would be complete without going to see Moncloa’s greatest treasure, the Templo de Debod. It was a gift to Madrid from Egypt in 1968, and it holds over 4000 years of history. If you’re looking for a special evening, grab a bottle of wine, a blanket, a significant other and go to the park surrounding the temple to watch the sun set over the city. If you’re looking for other places to visit, check out the Teléferico Cable Cars over Casa de Campo, and the Faro de Moncloa. Great news for any film buffs that don’t speak Spanish, Renoir Cinema in the area shows the latest movies in V.O. (versión original) which means that they’re in the original language, but dubbed over in Spanish. As well as students, Moncloa is home to a lot of families and elderly people so although it’s ideal for students, they aren’t the only residents. If you want an idea of the cost of rent in the area, check out our article on the cost of renting in the city. To sum up, Moncloa is a lively area with lots of places to escape to if you find the city sometimes feels a little claustrophobic. It’s well connected and has everything that you could need within walking distance. If you’ve found the perfect flat in Moncloa, make sure to read our 10 tips for renting in Madrid before signing a contract! 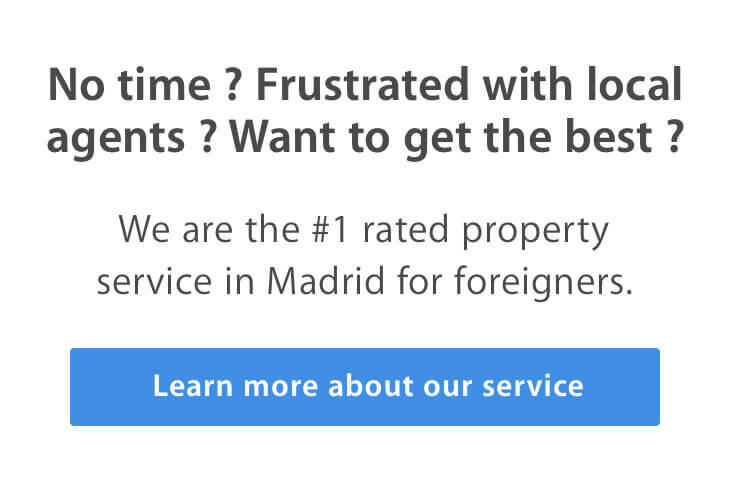 If you have any questions about the area or you would like some assistance in making your move to Madrid as smooth as possible, email us and we’ll set you up with a free consultation with our Property Hunting Expert, Ben. First of all, have a look to the interactive map to see where Moncloa/Arguelles is located ! I also invite you to read the post “Best neighborhoods” which can help you to choose the neighborhood which suits you the best. – To have a lot of shops and activity close to your house. You’ll find Gran via, the huge avenue ( full of international shops) where all the big theaters are, and also Starbucks in Madrid. – Running or just walk around your neighborhood, you’ll love the Moncloa park, very nice and quiet, you can also go to have a look to “Plaza de España” very close too. – Living in a nice neighborhood, full of activities, but very quiet by night. As a student, you’ll find Moncloa campus with a lot of universities such as “La universidad politécnica,” and the famous “Universidad Complutense de Madrid”. This neighborhood is full of students but you’ll also see families and locals live here ( as I said it’s quiet and very close to the center). You’ll find nice flats but you have to be carefull of the period if you want to rent, ( Semptember and January are generally the most expensive periods). By living in Moncloa/Arguelles, you’ll apreciate the groceries and shops, the activity of this neighborhood of Madrid; But also the proximity of the center and sport infrastructures such as “Puerta de Hierro” ( 15 minutes by bus with the line 83 or 133) where you can practice every kind of sports and enjoy the summer pool which is very nice with the hot temperatures during this time. If you go there, take a picnic (or eat at the bar cheap tapas) and just chill all the day, on the lawn ! At the end of the day I hope you enjoyed my post and don’t hesitate to contact us for more information,send us an email !